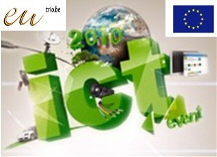 The European Parliament's Directorate-General for Innovation and Technological Support (DG ITEC), the Council of the EU's Communication and Information Services Directorate (SMART), and the European Commission's Directorate-General for Informatics (DIGIT) have joined forces to co-organise the largest EU institutions IT forum to date. DIGITEC 2018 will bring together the IT communities of the European institutions to share best practices around new technologies in public administration and to discuss how the digital future will shape the way large organisations work. Watch here the recorded sessions in Gold Hall and Silver Hall. Ms Mariya Gabriel, European Commissioner for Digital Economy and Society will open the Conference. Sir Julian King, European Commissioner for Security Union, will make statements on the second day of the conference. Throughout these two days, leading industry experts and policy-makers will share their insights into the latest developments in cloud computing, hunting, big data and the future of IT security. Sessions on Top Threat Actors, CTI and DMARC are also scheduled. Finally, the programme is rounded off by a panel on the CSIRT Network. CERT-EU is the computer emergency response team for the EU institutions, bodies and agencies. In recent years, Infosecurity.be has proven to be the online meeting place and trade fair for IT managers and IT professionals in the field of IT security. Together with The Tooling Event and Storage Expotrade fairs, Infosecurity.be offers market leaders, associations, speakers and other ICT professionals the ability to offer their ideas, techniques, services and vision of the most current IT themes. 5th edition of the European Cybersecurity Month, taking place during the entire month of October 2017 across Europe, aims at raising awareness of cybersecurity threats and promoting cybersecurity among citizens and organisations through education and sharing of good practices. ECSM is the EUâ€™s annual awareness campaign that takes place each October across Europe. The aim is to raise awareness of cyber security threats, promote cyber security among citizens and organizations; and provide resources to protect themselves online, through education and sharing of good practices. On 5 September 2017, Andrus Ansip, Vice-President of the EC in charge of Digital Single Market, took part in the Conference CERT-EU 2017 - The future of Cyber security in Europe. TechDays 2013 was, again, a great success! Close to 2900 IT Professionals, Developers and Students enjoyed 90 sessions with top content led by a broad selection of international and local top speakers. LCL : A secure environment for your datacenter. ALCATEL-LUCENT : Better datacenters with Application Fluent Networks. TYCO/AMP NETCONNECT : Beyond the speed of 10 Gbps. RITTAL : High Availability versus Power Effectiveness. : MINKELS: Operational Excellence in Datacenters.